For custom applications, the Regency Plateau™ outdoor gas fireplace brings you the design versatility of linear stainless steel burner to any outdoor landscape. 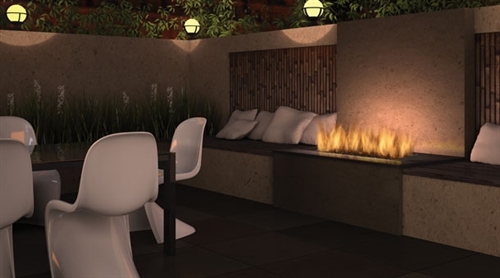 Whether you are a landscape designer or a homeowner looking to renovate an outdoor living space, the Regency Plateau outdoor fireplace creates endless design possibilities to your outdoor oasis. For an incredible dramatic effect, you can connect two Plateau outdoor gas fireplaces to make an impressive 60” linear gas fireplace.